We love our Maui Condo! Its a place for people to relax and enjoy each other with the beauty that surrounds them in Maui! Its a magical Island with so much to do! Sailing, Fishing, Diving, Swimming, Snorkeling, Volcano watching, Biking, Hiking and much more! Maui Oceanfront 2 bedroom- watch the whales and sunset from your master bedroom! You feel like you are in your own private place- no stairs or elevators with this garden levle unit. Great for families with children and older family members that don't have to take the stairs/elevator- Unobstructed View of the Island and Ocean! Great Sunsets- If you are lucky you might see the night rainbow! Private, quiet, oceanfront yes its only about 50 feet from the water from our Lani (Patio). Great Sunrise and Sunsets- Watch the Whales in winter months from our Lani. 2 Pools with 10 BBQ grills, 2 Hot Tubs, Putt put gold, Tennis courts, Grocery store and shops just 10 minute walk! One mile north of Black Rock snorkeling! Lahaina great fishing village, art galleries, shops, resturants, learn to surf, sail, take a snorkel boat to surrounding islands for the day! Not enough time to enjoy all the things to do! Our Oceanfront Garden Level 2 bedroom Condo is 50 feet from the Ocean! coffee maker, rice cooker, tea pot, blender, pots and pans, wine glasses, water glasses, plates, silverware, all cooking utensils and much more! Ceiling fans, Free Wi Fi, Pool, Hot Tub or Jacuzzi, Tennis, Vacuum Cleaner, Gas BBQ, Beautifully furnished island style! Handicapped Equipped -Installed Bars in Master Bathroom. $17.00 per day resort fee to be paid at front desk upon arrival! Condo was not ready when we arrived in the evening. Didn't get sheets until 8 PM and then had to make our own beds. The initial view of the ocean and beach when first arriving took our breath away! To experience that every day for a week was invigorating and renewing. The ground level unit was such a plus. We loved walking out onto the grass and having such easy access to the beach. I gave the unit 4 stars because of some needed maintaimemce issues. Overall it was an extremely satisfying stay. The best views! The location of this condo couldn’t be any better. We really enjoyed our stay. Location is fantastic and we really enjoyed our stay. Small decor changes could upgrade interior. 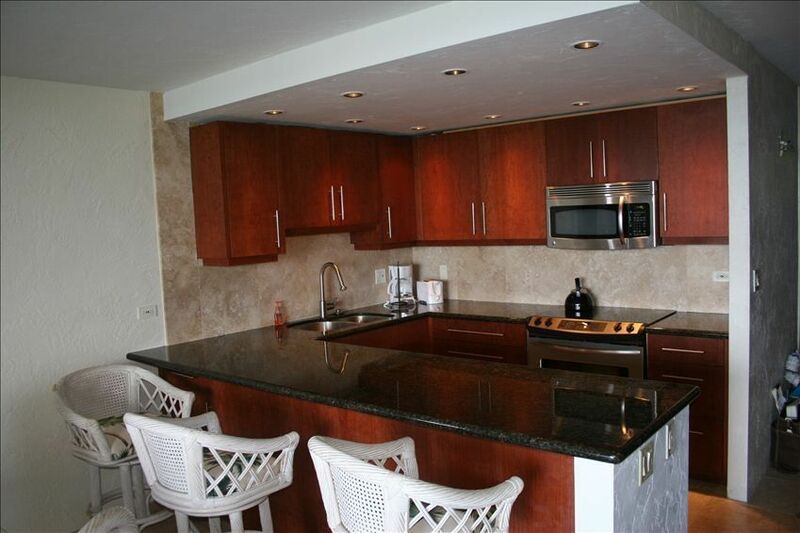 Excellent ocean front unit - upgraded and with a responsive owner! There were 6 of us total (4 adults and 2 kids) for 8 days and we truly enjoyed our stay. We have been to the Papakea many times, and you have to be really good about figuring out where the unit is, which building ,etc. This one is not only ocean front, it's also one of the quieter ocean front buildings. The kitchen in the unit has been upgraded and there was pretty much everything you could ever need for cooking (we had dinner in the unit 6 times) including spices and even condiments. There was snorkeling gear and a couple of quality boogie boards for the beach. The front bedroom is fantastic, while the rear is the usual you'd expect at the Papakea, and the fold out couch is ok for young kids though wouldn't want to be an adult on that mattress (about the only nit with the place). We had a couple of quick questions for Bonnie and she replied within 10 minutes, and everything was solved. Almost don't want to highly recommend this place so that we don't have to fight others to book it - then again, it's always good to recognize an owner that doesn't oversell their property and is responsive...so i guess we have to highly recommend :) Thank you for a great stay - we'll be back next year. Perfect spot to watch waves and whales. Super location. Great condo with two bedrooms and two baths. Well-equipped kitchen with lots of little extras (like coffee filters, skewers, and baggies!😀). Truly enjoyed the stay. 50 feet from the ocean! Pools, Hot Tubs, Putt Put Golf, Tennis and more! Mama's Fish House a must! Learn to Surf in Lahaina! Cleaning fee is $150.00, 17.00 per day resort fee to be paid at front desk upon arrival to receive parking pass!